Nigeria Police Force have denied reports that riot policemen protested over the delay in the payment of their special duty allowance in Maiduguri, Borno State, on Monday. However, a video showing the protesting officers has gone viral online. Spokesman for Nigeria Police Force , acting DCP Jimoh Moshood said in a statement in Abuja that the policemen simply visited the Borno State Police Command headquarters on enquiry over the delay of their allowance. The police claim is however contrary to pictures circulating online showing the men holding leaves and firing their weapons in the air. The police spokesman further explained that the “PMF that went on enquiry” were not attached to ‘Operation Lafiya Dole’ fighting against insurgency in the North East. He added that the policemen were a unit of visiting riot cops deployed in Maiduguri on crime prevention and other police duties in the state. 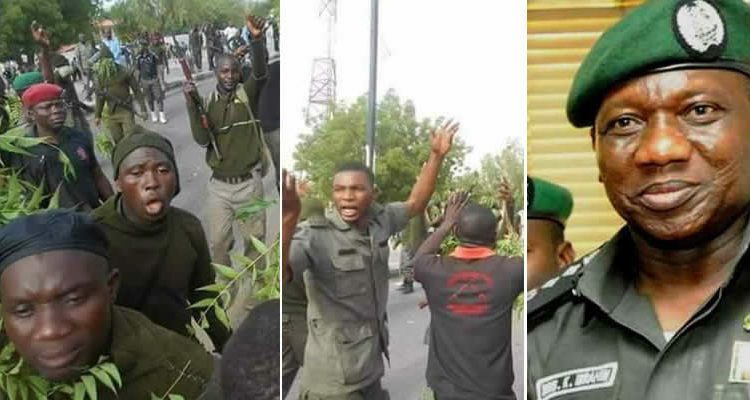 A video evidence emerge online after the Police authority denied reports of police officers protesting unpaid allowances in Maiduguri yesterday. Watch a video of the protesting police officers below.